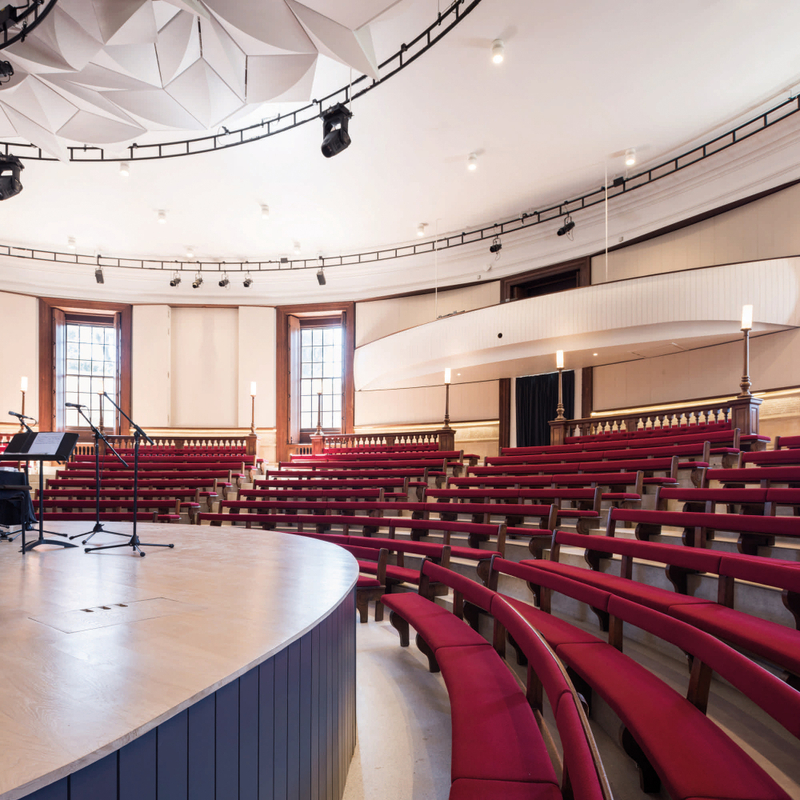 The refurbishment of an iconic building on the campus of Marlborough College in the UK is being recognized on the centenary of the end of the First World War, and for which Memorial Hall was created. Diamond Schmitt Architects and Ayre Chamberlain Gaunt have re-established the building’s original purpose as a theatre and memorial while preserving its character and unique ambience. The 600-seat heritage-listed structure opened in 1925 and has staged spoken word, music and plays by generations of Marlburians. It is also a place of sombre reflection that commemorates the 749 members of the Marlborough community lost in the Great War and whose names are engraved in stone around the perimeter of the hall. 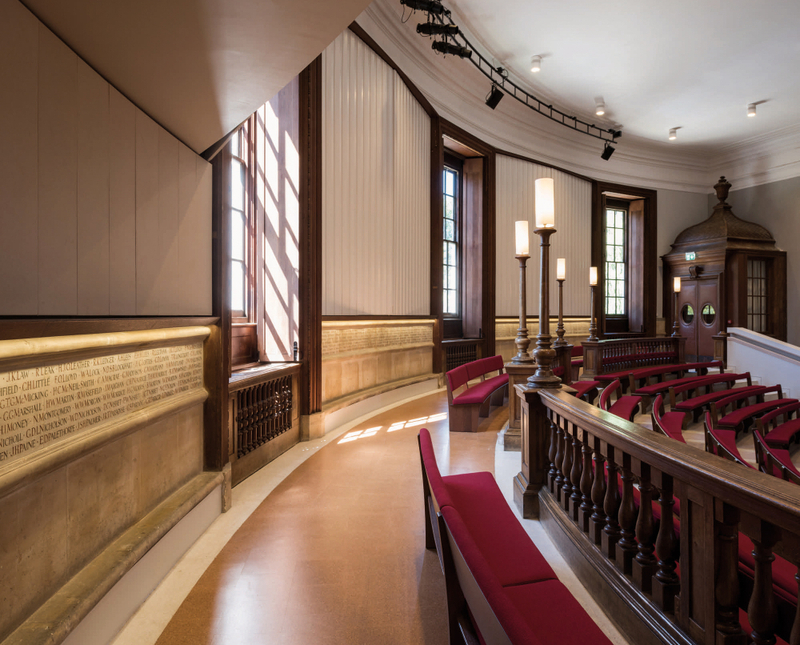 “It was important that the modernisation of Memorial Hall remain true to the original architecture,” said Matthew Lella, Principal, Diamond Schmitt Architects. “Where possible, original elements were restored and there is a clear distinction between heritage features and contemporary interventions,” added Dominic Gaunt, Director, Ayre Chamberlain Gaunt. The auditorium is an enclosed classical amphitheatre, a perfect semi-circle with a thrust stage at its centre. The intimacy of the room was compromised by poor acoustics that rendered parts of the stage unusable due to echo and reverberation. A proscenium that was too small, poor sightlines, a lack of amenities and a cramped back-of-house added to the complexity of the task. “We applied the benefit of 100 years of innovation and advances in theatre craft to create a top-tier environment for performance,” said Jack Diamond, principal with the design firm. The proscenium was widened to 12.1 metres from 8.6 metres to improve lateral views and acoustic connection, aided by re-raked front rows and a raised stage. n collaboration with acoustic consultant Neill Woodger, a unique system of variable and fixed acoustical reflectors was positioned above the stage. 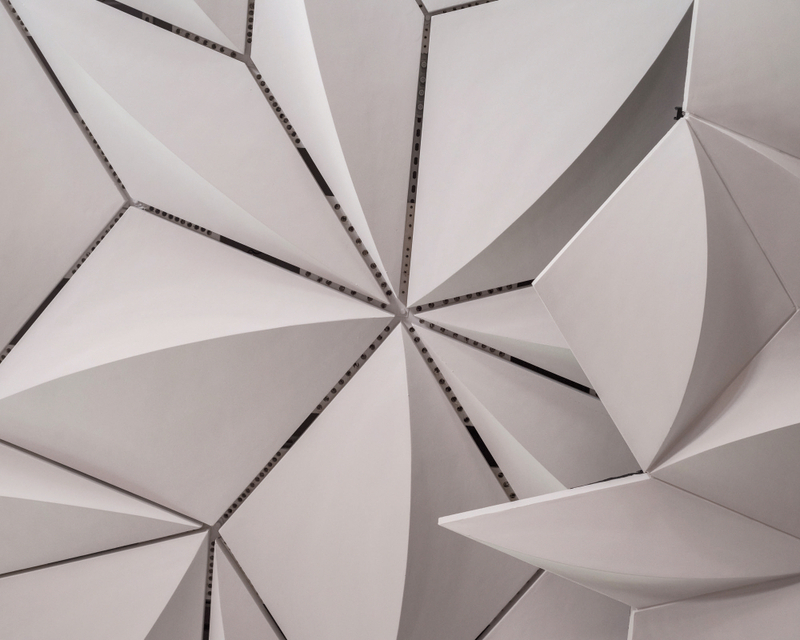 The design was inspired by a non-repetitive mathematical shape called a Penrose Tile to create a three-dimensional floral design to effectively disperse sound throughout the hall. 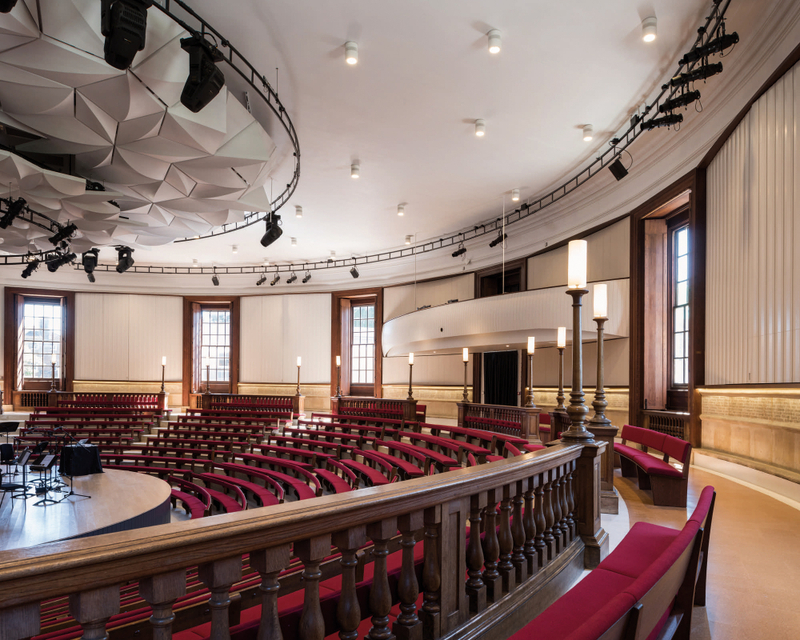 Additional acoustic treatments include reversible panels lining the room that can be either diffusive for solo or small ensembles or absorptive for orchestral performances. A mid-century control booth suspended from the back wall that obscured the fine cornice as well as the commemoration of names has been replaced with a streamlined transparent perch. New entrance lobbies on the lower level now connect directly to the auditorium. 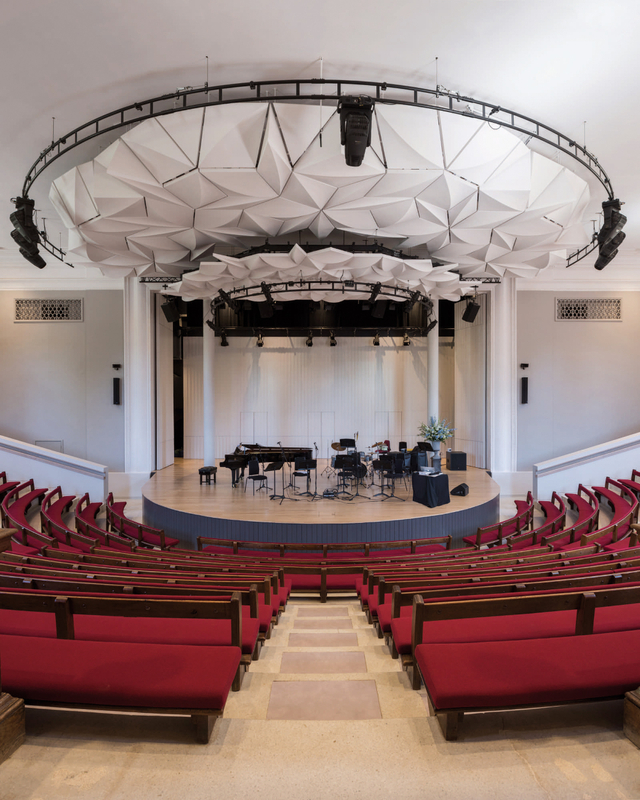 This respectful modernization remains true to the original architecture while resolving an acoustical conundrum that enables increased use of the building for both student and public performance. “We wanted a modern design with a natural order – a clear but relaxed structure perfectly at home in this classic English building,” added Lella. Diamond Schmitt Architects has offices in Toronto, Vancouver and New York City. The firm’s extensive portfolio includes commercial, institutional and residential buildings, libraries, performing arts centres, and healthcare facilities. Among current projects are the new home for the Senate of Canada in Ottawa; Robarts Common, the expansion of the largest academic library in Canada at University of Toronto; and Buddy Holly Hall of Performing Arts & Sciences in Texas.